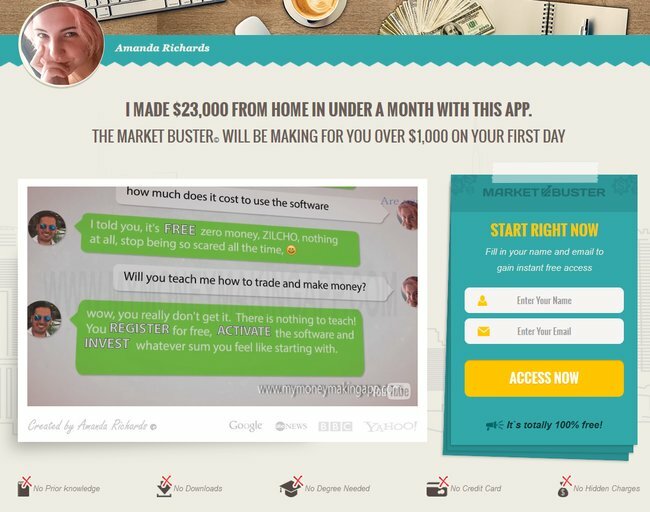 Mymoneymakingapp.com by Amanda Richards promotes a money making software called Market Buster, and claims that she’s making over $4,000/week from it. Don’t be fooled, as mymoneymakingapp.com and Market Buster are scams. Find out the truth in our mymoneymakingapp.com review. Amanda Richards from mymoneymakingapp.com claims that she was flipping burgers for minimum wages and piling up tuition bills, until her economics professor introduced her to Market Buster money making app. Since then, she makes over $4,000 per week from home by doing absolutely nothing. Yes, that’s what she said. 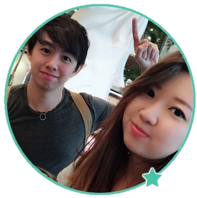 The Market Buster app she was introduced to is a fully automated money making software. Amanda claims that you can leave it on autopilot and it’ll still generate profits for you. Now if you are getting excited over the prospects of generating income from the internet automatically, let me tell you this – there is no free lunch in this world. I am an internet marketer who makes money from the internet, and I’ve tried various methods. Of course, this includes softwares like Market Buster. There are tonnes of them out there, and they are called automated binary trading softwares. But these apps, such as Market Buster that claims to make money for you automatically simply don’t work. We’ve reviewed Market Buster app before, and you can read the full review here. Market Buster is a binary trading software that trades binary options for you. You have to deposit at least $250 with Opteck to start trading with Market Buster app. The scammers behind Market Buster earn a sum of referral fees as soon as you deposit money with Opteck. You won’t be able to take any actions against Market Buster if you lose money using their app. 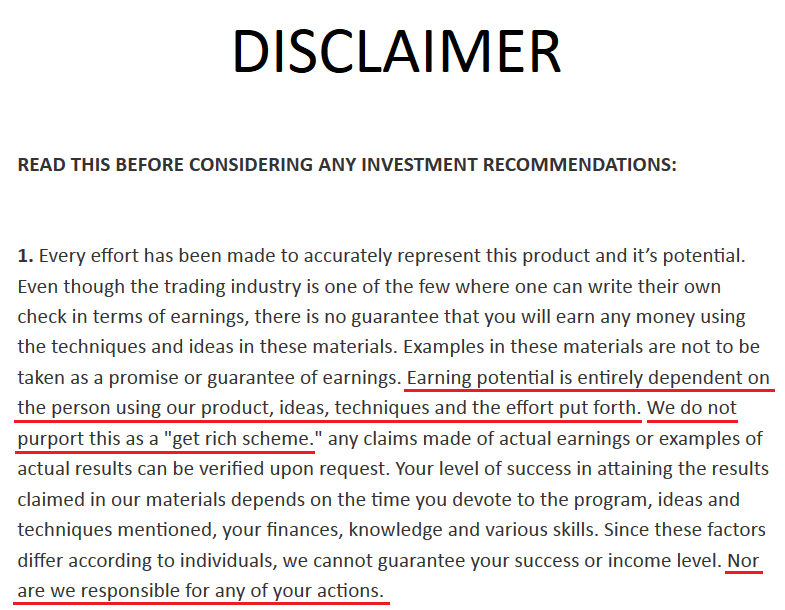 It’s written in the disclaimer that Market Buster makes no guarantee when it comes to earning money with the software. Mymoneymakingapp.com is just a landing page of Market Buster to lure you into the scam. Despite promising you a guaranteed profits generating software, Amanda Richards and mymoneymakingapp.com is saying otherwise in the risk disclaimer. The risk disclaimer is linked by a fine print at the bottom of the sales page. If you want to verify the authenticity of the quoted terms here, you can view the full disclaimer by clicking on “Disclaimer” fine print at the very end of mymoneymakingapp.com. Earning potential is entirely dependent on the person using our product, ideas, techniques, and the effort put forth. In fact, no guarantees are made that you will achieve any results from our ideas and techniques in our material. Despite being a fully automated software, somehow the earning potential is entirely dependent on your own ideas, techniques and effort. Compare this term to what Amanda claims in her website, and you’ll see how she tries to escape from her irresponsible promises. Even though Amanda promises you hundreds of dollars profits per day, you shouldn’t view it as a “get rich scheme”. That’s because “get rich schemes” that promise exorbitant returns are illegal in many jurisdictions. My Money Making App is not responsible if you choose to use the software. You are on your own if you use the app and lose money. The earnings and results shown in the sales materials are intended to express the scammers’ own OPINION of My Money Making App’s (a.k.a Market Buster’s) earning POTENTIAL. In short, the trade results shown are not real! Despite boasting how My Money Making App / Market Buster produces profits automatically, there’s no guarantee that you will achieve any results with the software. In fact, you are most likely going to lose all your deposits. Fact #4 alone should be enough to steer you away from the scam. How can anyone trust a software that reports fabricated earnings in their sales materials? These terms and conditions are not here to give you a fair warning as a consumer. The sole purpose of this document is to protect the scammers from legal actions when you lose all your money using the software. If they wanted to be honest about the risks of using the software, and the fact that all results shown are only opinions, they would’ve told you in the sales materials. Instead, they chose to present you with fake testimonial and promises. YES, MYMONEYMAKINGAPP.COM IS A SCAM. As we’ve said in the review earlier, we don’t recommend binary options trading as a way to make money online, at all. It’s basically the same as gambling, and using an automated trading software is no different. You are essentially putting your hopes and entire investment in a piece of software that gambles on your behalf.